Is there anyone out there who can even remotely do this math and explain how you can get to numbers like this — not how they can be justified, for, given the business interests involved, they are not irrational. But how many widgets, and of what kind, does a law firm have to spit out to get to these kinds of numbers? Well, Vicky, sure, I know you can ultimately subdivide billers and hours and get to this number, but — 20 lawyers? Ten billable hours a day for a solid year? When I ask “what are the widgets,” I’m asking: What sort of work product would require that much billing? I DO know something about this particular litigation and the people/firms that litigated it. “Settle It Now” — my ADR firm name — was reactive to a case of this magnitude — an antitrust case — that my team (2 partners; five associates; 2 paralegals) was billing the client about $300K/month for. The parent company “augmented” the trial team 3 months before trial. The new “trial” firm turned its entire operation upside down and charged the subsidiary (my client) $2 million every other week. Then they settled the thing (in my absence) for 50 times what it was worth. That was the end for me. I transitioned out of practice and into mediation. Now, I’m not suggesting that any of the firms in Bratz litigation were “churning,” especially because the defendant has to respond to whatever the Plaintiff does. In my antitrust case, that included 42, count ’em, 42 motions in limine two months before trial. Jury consultants. Experts. Marketing teams preparing exhibits. If you demand Cadillac service, you pay for it. These companies know what they’re doing when they launch litigation like this and hire the firms they hire, they know what it’s going to cost them. I had an environmental coverage case before the antitrust case described above and we spent six months deposing witnesses about HOW THE DOCUMENT PRODUCTION WAS CONDUCTED. When I was arbitrating a license agreement case being litigated by firms of this stature, I received two or three tabbed binders of new briefing and supporting evidence on my doorstep EVERY MORNING during a two month proceeding. What can you do litigate in a trademark case to justify this sort of treatment? Every minute of every day of both companies’ business and design plans, since this one is really based upon the Q: was this doll designed on the job or before Bratz-guy joined Mattel. I think they took his MOTHER’s deposition. It simply doesn’t surprise me that you can take a relatively straight-forward legal issue (like, does “sudden” mean “quick” or only “unexpected” in a pollution exclusion contained in a CGL policy) and turn it into a 20-year legal practice. $93 million in legal bills does seem a bit hard to justify. Still, I wonder about the fee breakdowns, including discovery costs and legal analysis of the potential infringements. 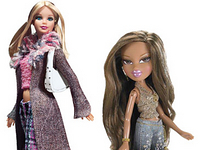 Just for the heck of it, I looked up the Bratz toy line on Wikipedia. Youâ€™ve got more than a hundred toy sub-lines, most of these sub-lines with four or more dolls. Thatâ€™s a lot of toys. Wouldnâ€™t part of estimating damages in the case involve hiring experts to compare the dolls to whatever original drawings, concepts, or what have you the artist created when he was presumably an employee of the Plaintiff? I canâ€™t put a number on that, but I donâ€™t imagine that a contract to examine 400+ dolls would come cheap. And that doesnâ€™t even count the Bratz movies. I can also see discovery costs adding to the legal fees. With doll collections going all the way back to 2001, youâ€™re looking at a huge number of pages for the contract attorneys to look through. If that discovery team were in the DC area, the fees would mount up quickly. Here, your average contract attorney (barred in DC) is paid $35/hour for his first 40 hours of work per week, and $52.50 per hour beyond that. If youâ€™ve got a team of, say, 50 contract attorneys plugging away 60 hours per week â€“ which is not unrealistic in litigation this large â€“ youâ€™re talking about a payroll of $122,500 per week. This doesnâ€™t even take into account the staffing agencyâ€™s overhead, or even whether the law firm tacks on its own overhead. If we assume for the sake of argument that these attorneys are billed out at $100/hour (for no other reason than its being a nice round number), youâ€™re looking at $300,000 per week of discovery costs. And the billables for the third-year associate paid to babysit the contract attorneys is the cherry on top. Iâ€™m not entirely sure how many documents would come out of eight years, but I could easily see it topping a few million. Which is several weeks of doc review â€“ possibly even a couple months â€“ even if you have a squad of crack attorneys. I expect that these numbers wouldnâ€™t quite get us to $93 million or more, but I can see where a lot of the expenses would start to stack up. And I wouldnâ€™t be surprised if discovery costs are a good-sized chunk of it. Am I totally off-base here? Litigation motivated by principle and not money is one of the most costly types of litigation, but litigation lawyers who charge by the hour are sure to love it and there’s no shame in profiting off it, as long as the lawyers are acting ethically while litigating and accurately counseling their client on the cost of litigation. I agree with everything you’re saying. I am still astonished, however, that fees of this magnitude could be racked up in that case.